Starting tethered caching… 2017-02-28 10:47:59.691 AssetCacheActivatorUtil[3848:192902] Built-in caching server can be activated. 2017-02-28 10:47:59.706 AssetCacheActivatorUtil[3849:192910] Built-in caching server is deactivated: (no error) Filtering the log data using “subsystem == “com.apple.AssetCache” AND messageType == 16″ Timestamp (process)[PID] 2017-02-28 10:48:05.098735-0600 localhost AssetCache: [com.apple.AssetCache.builtin] Built-in Caching Server activated. Exiting to allow re-launch. 2017-02-28 10:48:05.207493-0600 localhost AssetCache: [com.apple.AssetCache.builtin] Built-in Caching Server shutting down (0) 2017-02-28 10:48:07.362926-0600 localhost AssetCache: [com.apple.AssetCache.builtin] Built-in Caching Server version 170 started 2017-03-02 10:45:53.753 AssetCacheTetheratorUtil[29283:2526186] Tetherator enabled. Started tethered caching. To stop it, press control+c once. Once enabled, updates will be cached to the computer that the service is enabled on, metadata stored in the previously mentioned database, and then change ports and network ranges when needed. 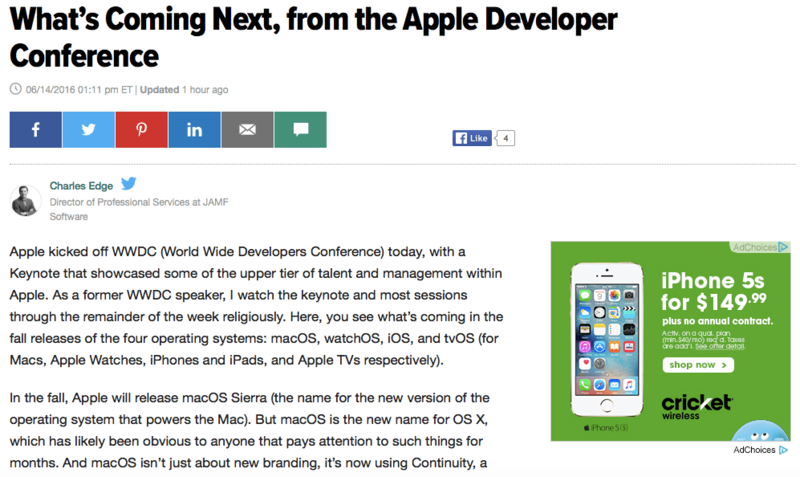 Posted a Huffington Post article from my notes from the WWDC keynote. Hope you enjoy! Apple kicked off WWDC (World Wide Developers Conference) today, with a Keynote that showcased some of the upper tier of talent and management within Apple. As a former WWDC speaker, I watch the keynote and most sessions through the remainder of the week religiously. Here, you see what’s coming in the fall releases of the four operating systems: macOS, watchOS, iOS, and tvOS (for Macs, Apple Watches, iPhones and iPads, and Apple TVs respectively). To read the rest of the article, click here to jump to Huffington Post. BTW, Applednld is load balanced between 17.253.29.201 and 17.253.29.202, both within Apple’s Class C.
Episode 3 of the MacAdmins Podcast Now Available! When applying management profiles, it helps to be able to look at the logs and troubleshoot why any settings aren’t applied. 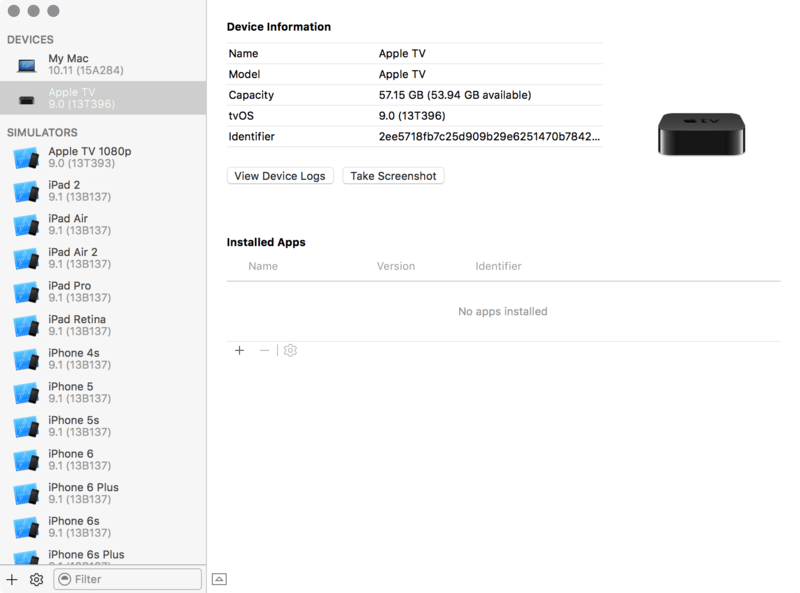 To view logs on an Apple TV, open Xcode and then click on an Apple TV. 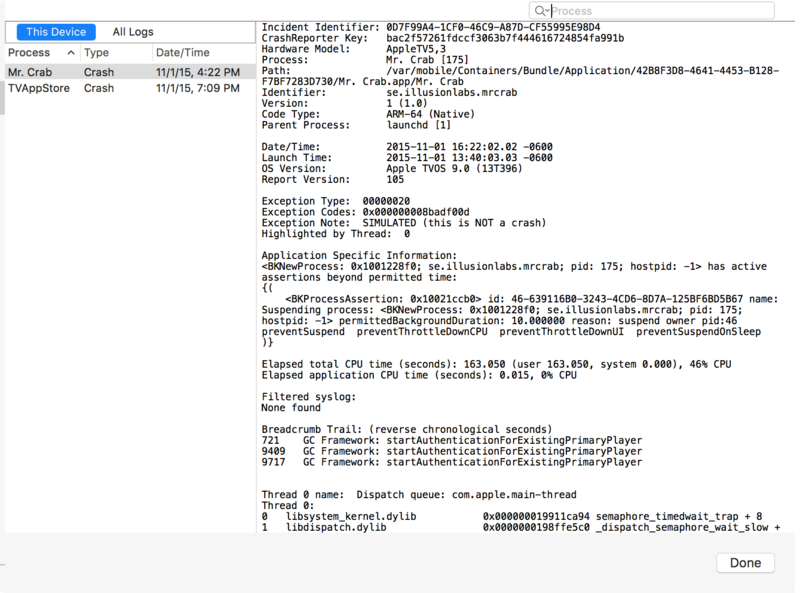 From the Apple TV screen, click on View Device Logs. The logs will appear in the app. Click Done when you’re finished reviewing the logs. 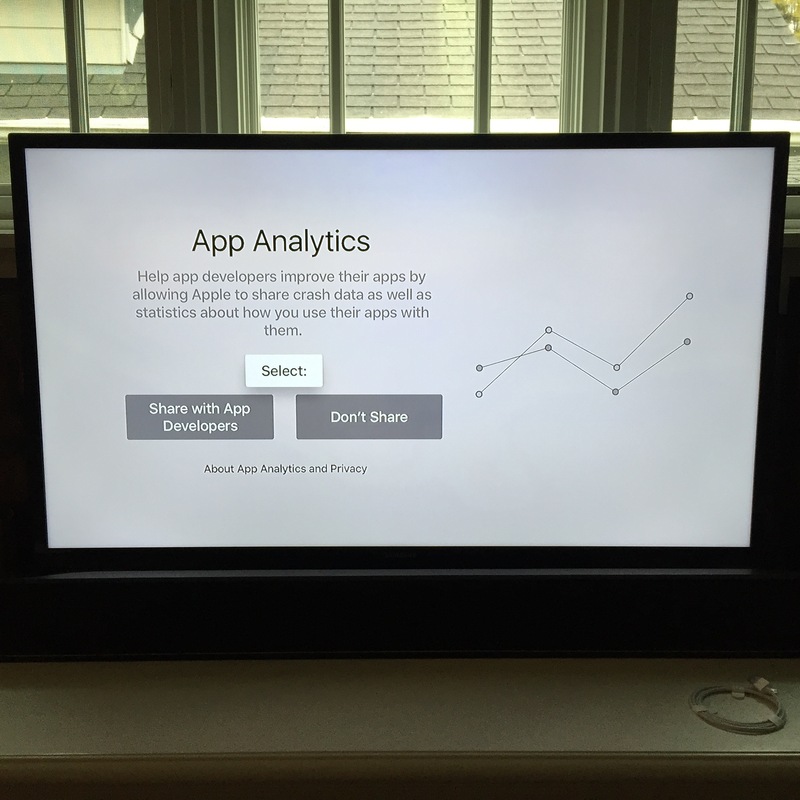 The 4th Generation of the Apple TV supports installing apps. And part of playing around with new apps is sometimes you’re not going to want them on your TV any more. 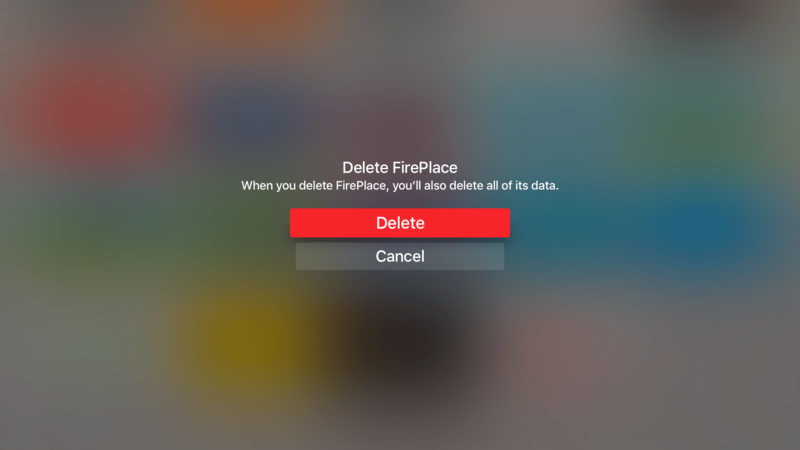 To remove apps, the process is similar to that of an iPad. Highlight an app that you’d like to remove and then hold down the clicker on the app. The app will go a little larger. Click on it again and you’ll get the option to Delete the app. Click Delete and the app disappears. That’s it. The app, and any storage that is being consumed by the app, is then freed up. 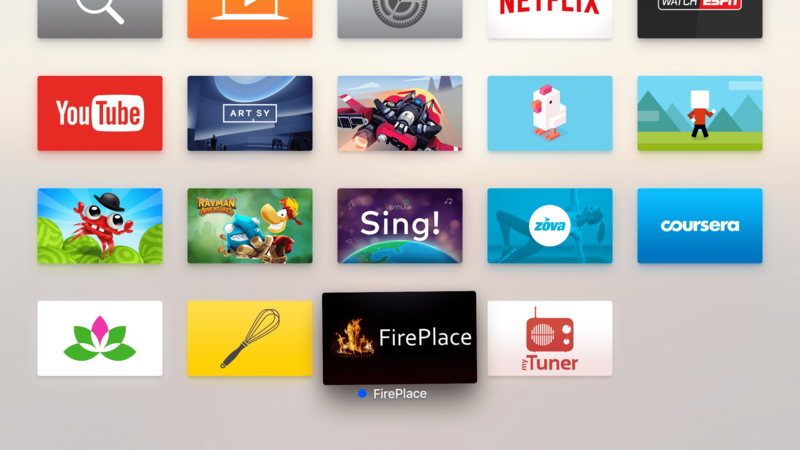 The most substantial part of the update to the 4th generation of the Apple TV is the addition of an App Store. Awesome! There are a nice number of apps so far. Not too many, just yet. Let’s look at installing an app. 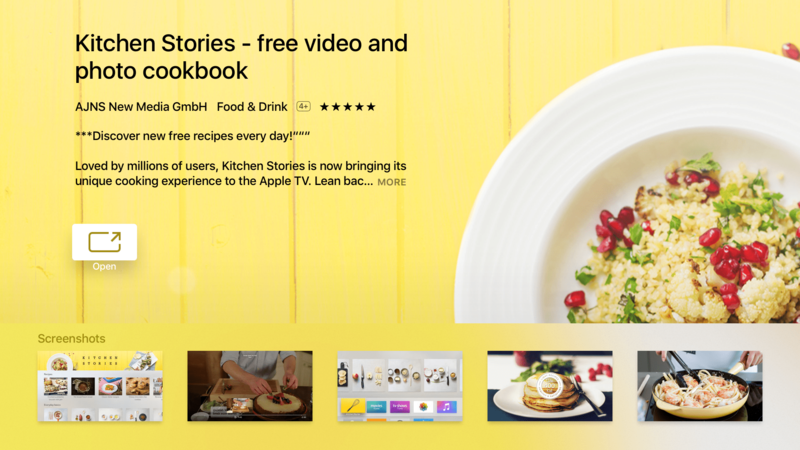 To do so, start your Apple TV and from the home screen, click on the App Store icon. From the App Store, search for an app and click on it. If you like the screenshots, click on the Get button (it’s a free app so it says Get). Once installed, click on Open. The app opens. Yay. Very easy. 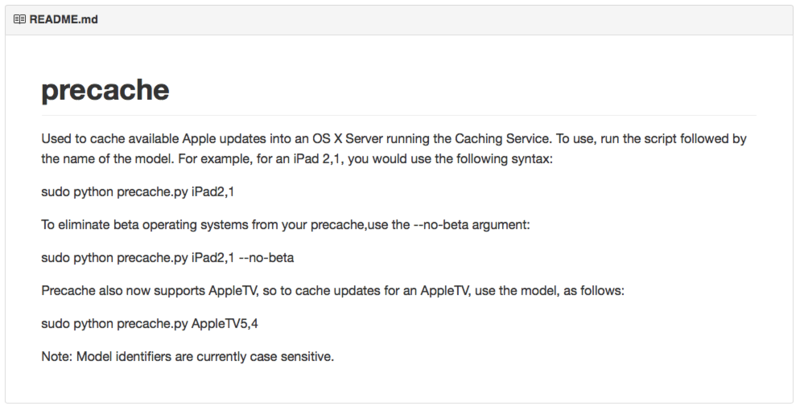 Some of the apps from your other devices may work on the Apple TV. If you go to Purchased Apps from the top row of options, you’ll be able to click on All Apps. 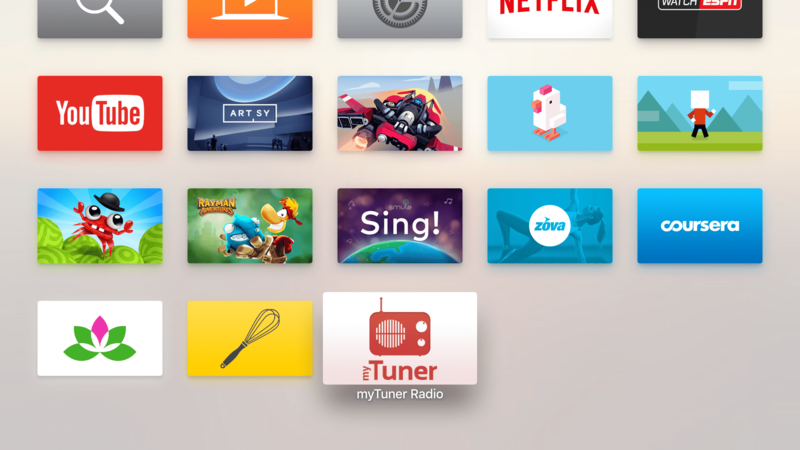 From there, you’ll see a list of apps available for the Apple TV. If you click on an App, you can then click on Install. Once installed, you can open apps and use them. The new fourth generation Apple TV is everything I hoped the third generation would be. 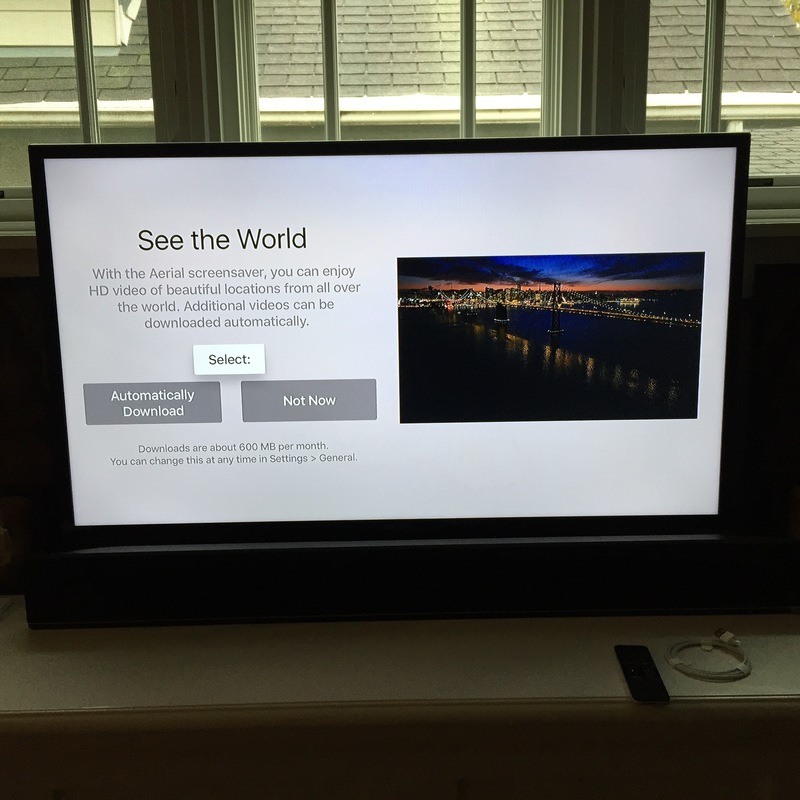 We have a touch remote with a Mic, great video, USB-C, and most importantly, an App Store! And while I have security concerns around the setup process, I am sure Apple has thought through the myriad of questions I have surrounding sharing Apple ID keys over bluetooth from a phone to the Apple TV to streamline the setup process. So about that setup process. 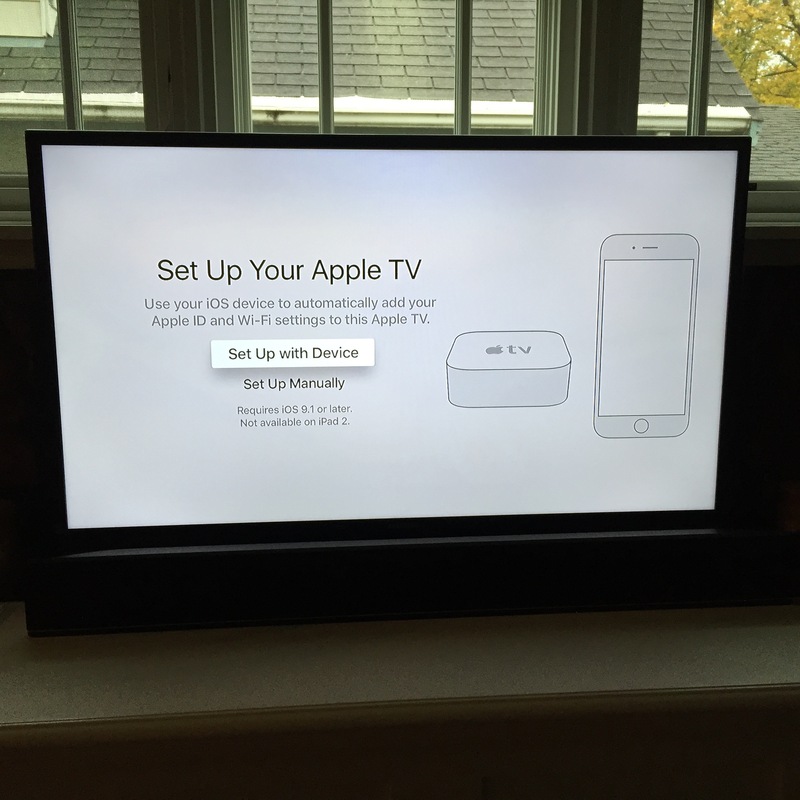 Configuring the new Apple TV is pretty straight forward. To get started, get your phone out. Yes, your phone. Then unwrap the Apple TV and plug it into the HDMI port on your TV and the AC adapter (which is the same as the second and third generation Apple TVs). 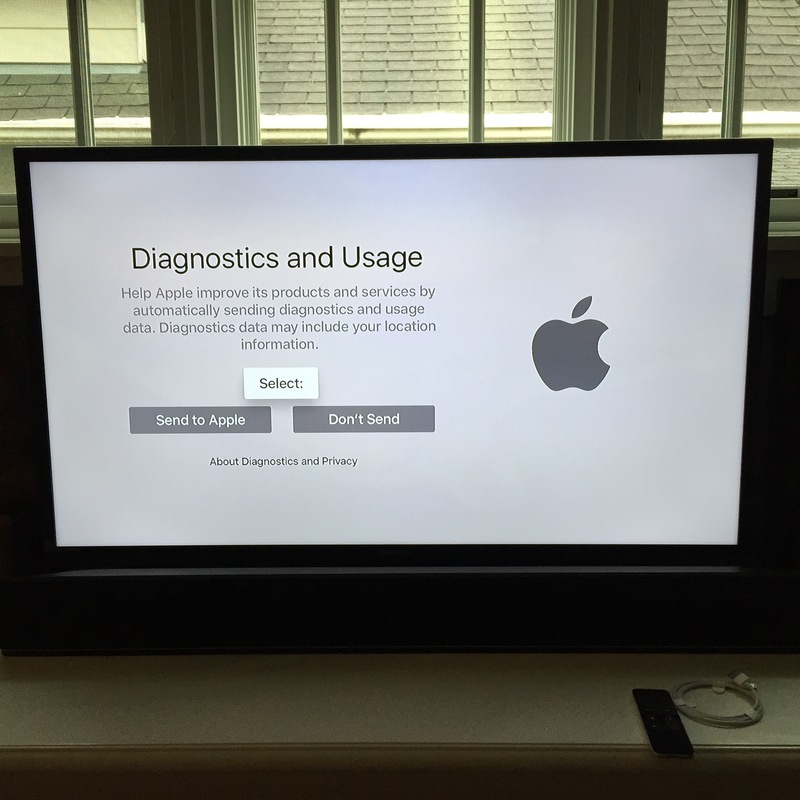 Once plugged in, boot up your Apple TV. When prompted, click Set Up with Device on the fancy new remote. At the Set Up Your Apple TV prompt, make sure that Bluetooth is enabled on your phone and then wait for it, the TV will see your phone! When prompted on your phone, tap Continue. When the TV tells you to enter the Apple ID on your phone, make sure your phone is unlocked and then provide that information. 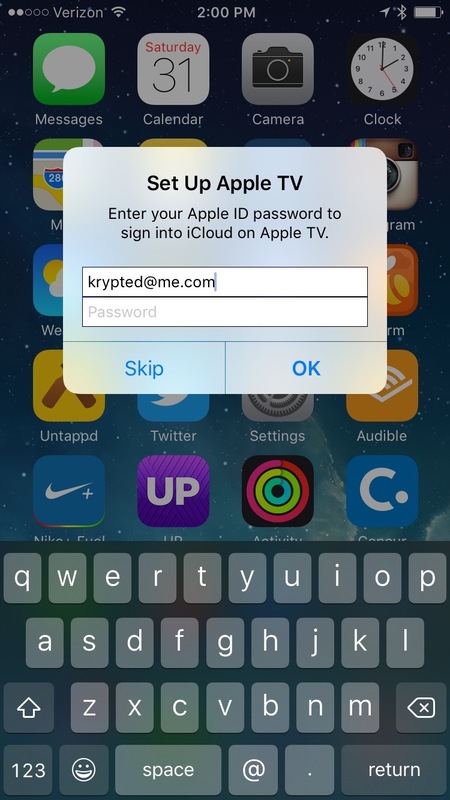 You’re then prompted for whether you’d like the Apple TV to retain your password. Obviously, if you have kids that love to buy in app purchases, this might be a bad idea. If you live alone, maybe a good idea. Make your selection and then you’ll be prompted for whether you’d like to send data to Apple. I usually tap OK here, as I prefer my experience to get better with products (and usually don’t go in for all the tin foil hat stuffs). 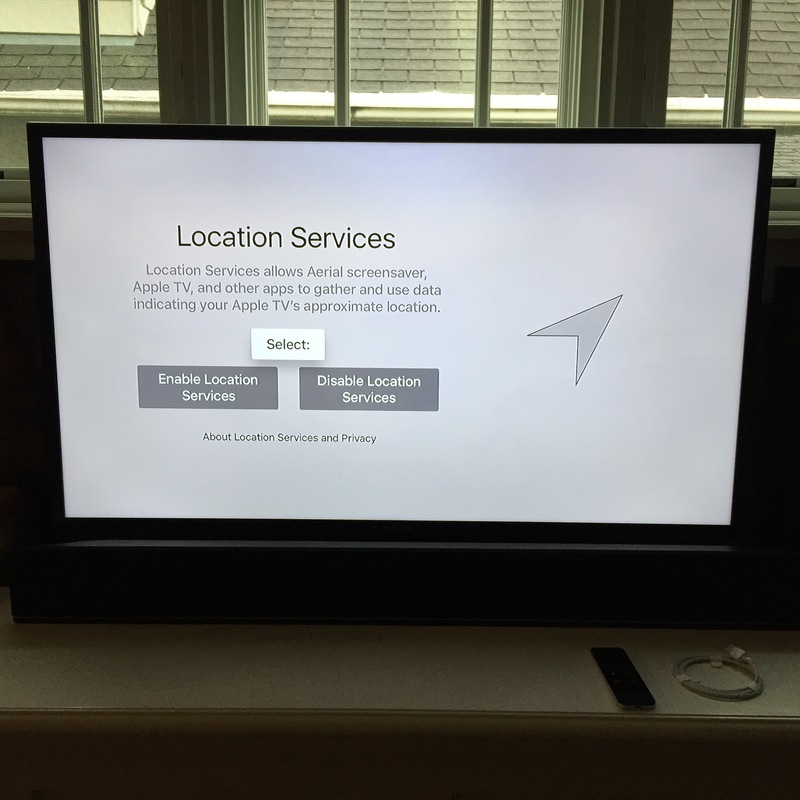 Back on the TV, choose whether or not to enable Location Services. 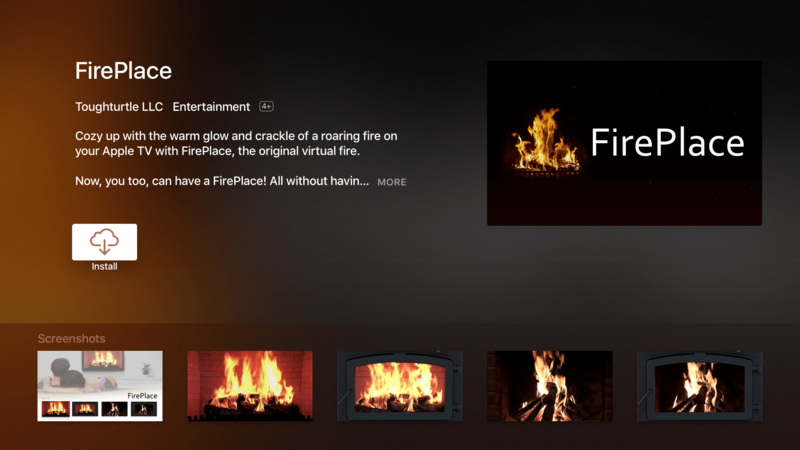 If you travel with Apple TV, this might be helpful. If not, then it’s likely not a biggee. 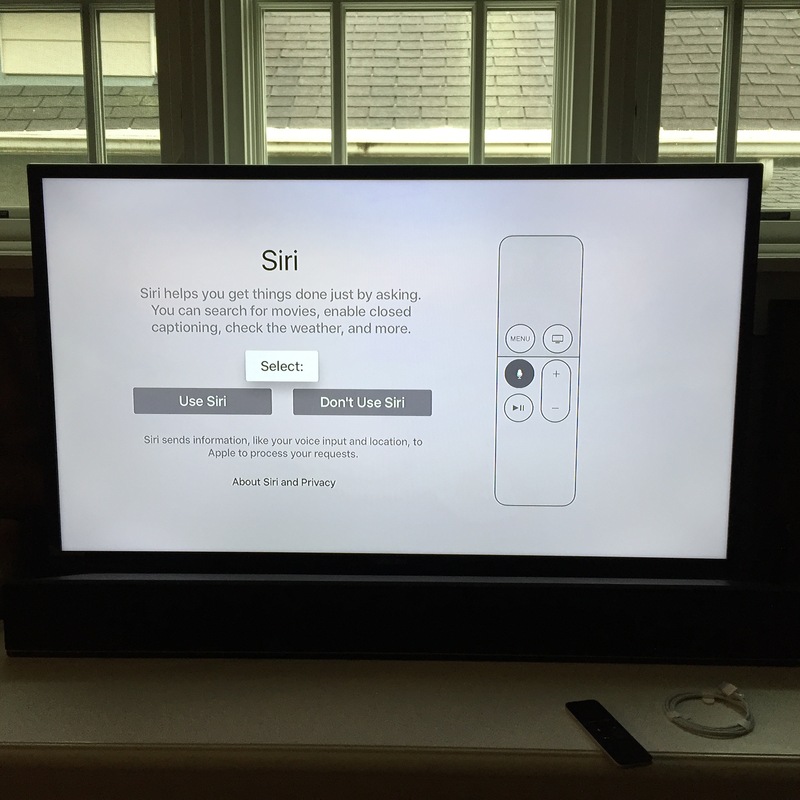 One of the great new features is the new Siri integration with Apple TV. While Siri on my TV doesn’t seem to like me much, I’m sure it’s my fault, so I’d still click that Use Siri option. I loved the photos on the previous generation of Apple TV, so decided to let Apple give me some more. You may not want to use their background for a screensaver. Click Automatically Download if you’d like to use theirs, or Not Now if not. You’re then prompted for whether or not to send Diagnostics and Usage Data to Apple again. Choose if you’d like to do so. If you want your apps to get better, click Share with App Developers. 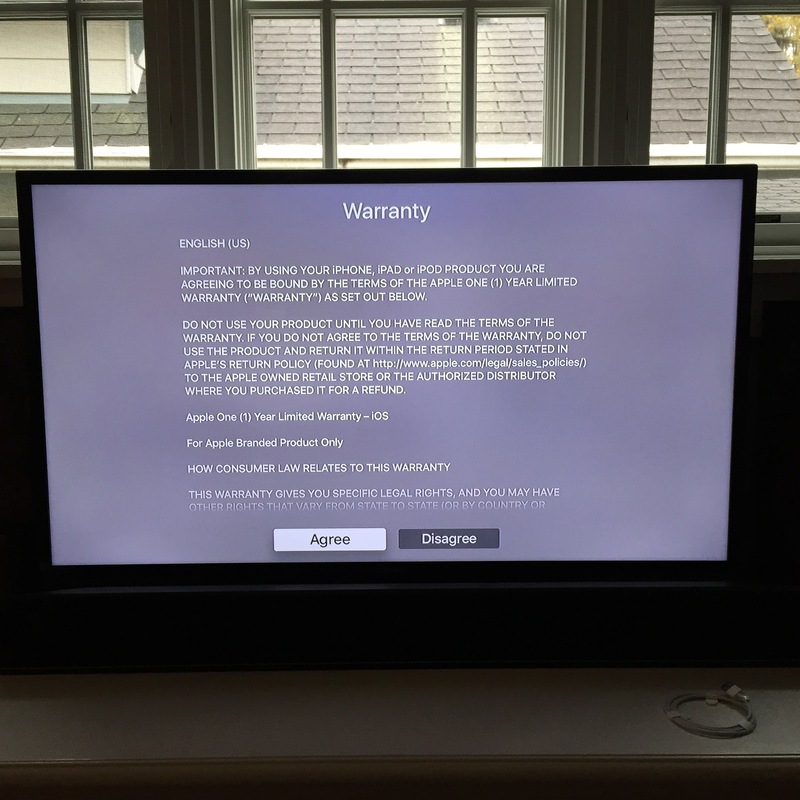 Click Agree to agree to the warranty. 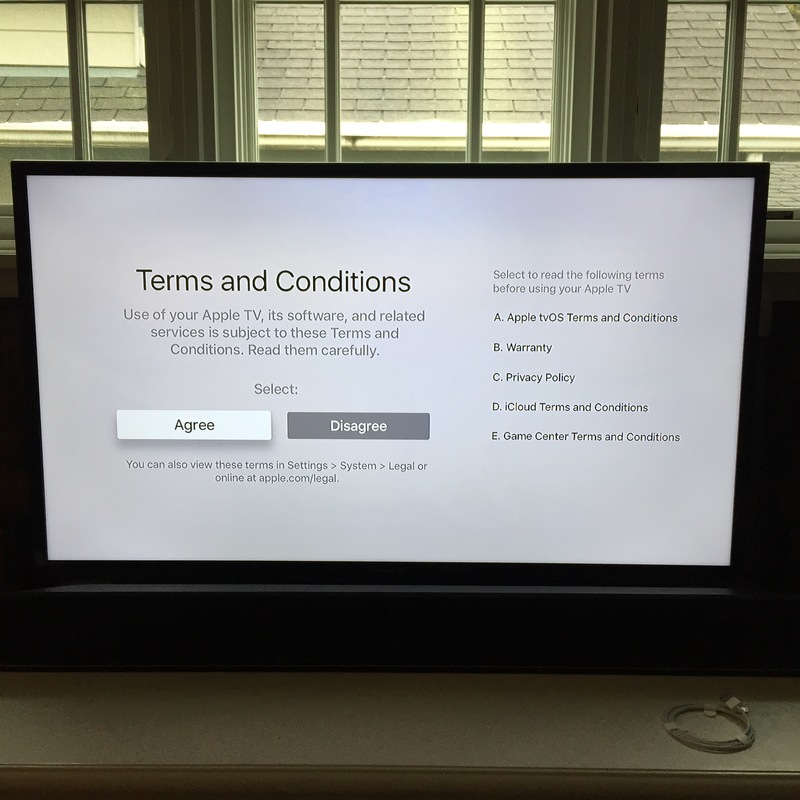 Click Agree to agree to Apple’s Terms and Conditions (for these, you can’t proceed unless you agree to them; otherwise you can return the device). 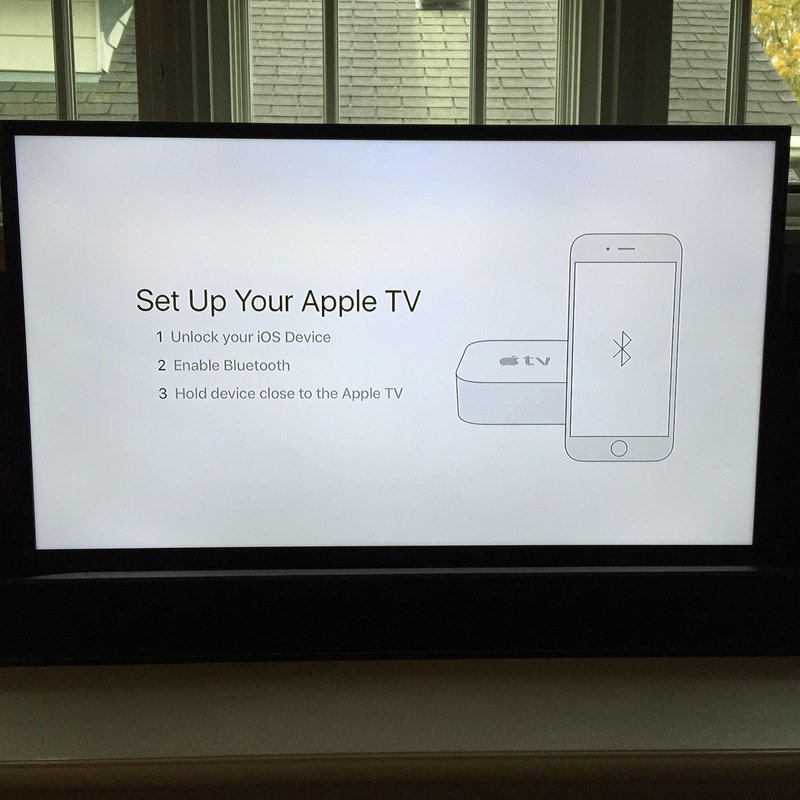 Now you’re at the Main Apple TV screen. If you’re used to using Netflix, the next thing you’ll want to do is head over to the App Store and install some apps. You can also go ahead and start buying media, etc. Enjoy!